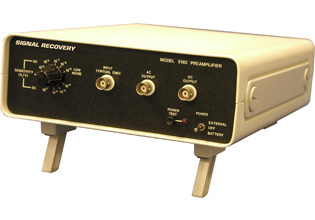 The model 5182 is a current-to-voltage preamplifier of low noise and low input impedance designed to amplify the extremely low currents encountered in such areas as photometry and semiconductor research. It has four standard sensitivity settings but in addition includes a special low-noise mode on the highest gain position for even better low current measurement capability. The unit features two outputs, allowing both the AC and DC components of the input signal to be independently monitored, so that, for example, in a PMT application the bias current can be measured separately from the signal current. It can be powered from its own internally housed (alkaline) batteries, an external low voltage supply (±15 V or ±18 V) or from the model PS0108 remote line power supply(optional extra). This preamplifier can also be powered from most of our range of lockin amplifiers. Battery powered from internal alkaline batteries or external DC power supply.